Try a 5-pack of Jimmy's ULTRA DEW and shipping is on us! Two flavors: Potent Cherry and Icy Lemon. 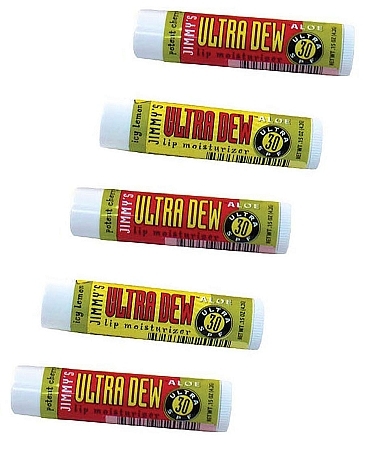 Jimmy's ULTRA DEW has been protecting lips since 1999. You'll love the way it makes your lips taste and feel. ULTRA DEW lip moisturizer was specially formulated in 1999 for the arid environment of the Utah desert and extreme temperature changes of the Utah mountains. It contains the highest quality sun protection, moisturizing and flavoring ingredients, matching the quality of the most expensive products, while maintaining the pricing of mid-range products. The high SPF 30 formula is packed with Aloe and Vitamin E to keep lips protected in the harshest conditions. Protects lips from the sun, wind, heat and cold. Perfect for surfers, swimmers, hikers, skiers and outdoor enthusiasts of all types. Heals and moisturizes chapped, sensitive lips. Great for under the nose too! ULTRA DEW is available in two great flavors, Potent Cherry and Icy Lemon, appealing to men, women and kids.